new metroTab (Chrome) - My new favorite start tab for Chrome ~ Android Forever! If you aren't using one of the many great new tab apps in either Chrome or Firefox, you're missing out on a wonderful capability now available in these browsers. There are several add-ons or extensions you can choose from, and I've been trying them all. My new fave, as the title of the post suggests, is this one: new metroTab for Chrome. 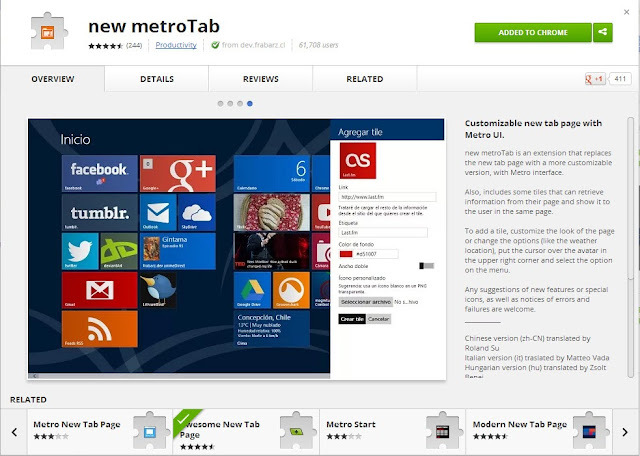 Developer Quote: "new metroTab is an extension that replaces the new tab page with a more customizable version, with Metro interface."